If you’ve ever been served Beef Wellington, you probably gazed at the layers of beef and mushrooms encased in pastry and wondered how it was prepared. Although the process is labor-intensive and time-consuming, cooking a delicious Beef Wellington is relatively easy, even for novices. Make your own puff pastry crust for Beef Wellington if you are a purist who shuns the incorporation of prepared store-bought products into recipes. Otherwise, most modern recipes suggest using thawed puff pastry dough available in your grocer’s freezer. 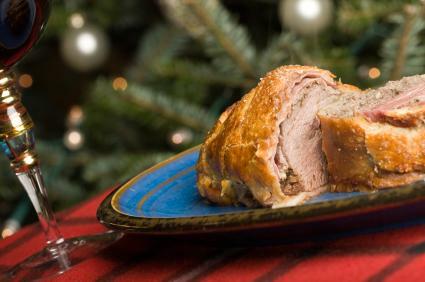 Traditional Beef Wellington recipes include pâté, which you can omit if you or your guests find the flavor or texture of liver spread distasteful. Many recent versions of Beef Wellington incorporate ham or prosciutto into the recipe for added taste and richness, another option you can consider. No matter what variations you use, as long as your recipe includes beef tenderloin, duxelles (a mixture of chopped and sautéed mushrooms and onions) and a pastry crust, it will meet the basic requirements of Beef Wellington. Since there are so many steps in cooking Beef Wellington, read the recipe several times to make sure you have all the ingredients readily available and have allocated enough time to prepare and roast the dish. If you have never made the recipe before, err on the side of finishing ahead of time; you can refrigerate fully prepared Beef Wellington for several hours before roasting without compromising quality. If pastry making isn’t your forte, purchase a box of it premade and let it thaw overnight in the refrigerator. Spread a thin layer of pâté over the surface of the beef before placing it on the mushroom mixture to add authenticity to the dish. Mix the salt and flour in a large mixing bowl. Using a pastry blender, fork or your hands, mix in the butter and shortening until the mixture forms into coarse crumbs about the size of peas. Add the cold water a few tablespoons at a time, mixing well with a fork after each addition. When the pastry dough ingredients are fully incorporated, form the dough into a ball and tightly wrap it in plastic wrap. Preheat the oven to 425F degrees and adjust the rack to the middle position. Melt butter in a heavy skillet over medium to medium high heat. Add mushrooms and onions and sauté for approximately 20 minutes. Add the flour, 1/2 teaspoon salt and 1/8 teaspoon pepper and stir. Slowly pour in the broth, stirring constantly to avoid lumps. Bring the mushroom onion mixture to a boil. Stir and cook until thickened and remove from heat. In a medium bowl, combine the mushroom mixture, ham and parsley. Season the beef all over with the remaining salt and pepper. Place it on a rack in a shallow, open roasting pan. Roast between 30 and 40 minutes. Remove from oven and let rest for 20 to 30 minutes. Lower the oven temperature to 400F degrees. Roll out dough on a lightly floured board into an 18-inch by 14-inch rectangle. Evenly spread the mushroom mixture over the dough, leaving a one-inch border on all sides. Center the tenderloin on the pastry and fold the pastry over it to form a sealed package, using a bit of water to secure the edges. Place the package on a greased baking sheet or one lined with parchment paper. Brush the entire surface with the egg wash and cut small venting holes in the top of the pastry to allow steam to escape during roasting. Sprinkle the pastry with sesame seeds. Bake uncovered for 30 minutes at 400 degrees until the crust is puffy and brown. Let the roast rest for 10 minutes before carving and serving. Give yourself due credit if your Beef Wellington turns out well and elicits gasps of gastronomical pleasure from your guests. Pay attention to feedback so you can adjust the recipe to perfect the next Beef Wellington you prepare.